Britain can no longer AFFORD any more Etonians – taking British jobs and putting strains on housing, the NHS and PUBLIC SERVICES! Where are all the left-wing rebellious Old-Etonians? Or are they all brainwashed? Now who wouldn’t vote for that? Can we include an exile clause too. The only British jobs are in the public services aren’t they and they are taken up by the pen pushing interfering middle class. 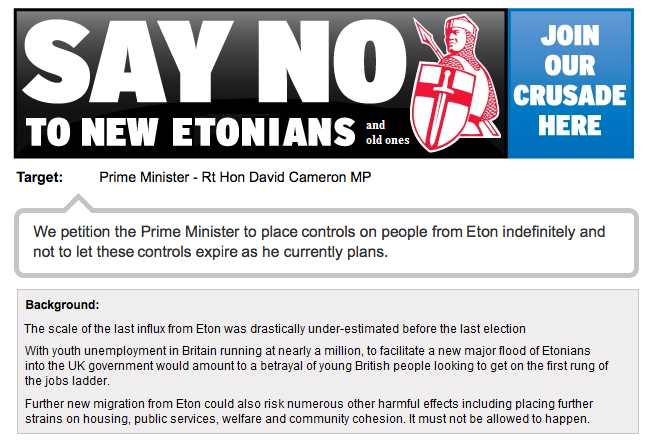 Is that Etonians like Cameron? Of course, the purpose of this petition is to show public opposition to the rule of a rich elite, which regards their social inferiors merely as the tools for their own enrichment, and which is doing everything to block their social advancement, and degrade them, and destroy their quality of life. I’ve no doubt this petition, if it gets anywhere, will be greeted by the right with howls of ‘Inverted snobbery!’ Nevertheless, this is not the first the time there has been a campaign against elitism. Quite apart from the fact that government ignorance and indifference to working class issues was the reason for the foundation of the Labour Party in the 19th century, a similar campaign to this was launched by Willy Rushton, the cartoonist and one of the founders of Private Eye in the 1960s. Rushton was incensed that, while Britain was increasingly becoming a classless society, Harold MacMillan should turn his back on his social inferiors and choose a fellow aristocrat, Alec Douglas-Home, for one of his posts. In protest, Rushton founded the ‘Death to the Tories’ party, and travelled the length and breadth of a Scottish constituency to gather votes. He was spectacularly unsuccessful, and only got one. This petition is already far more successful.